At about 7.30 a.m. on Sunday, Turkish soldiers shot dead Petros Kakoullis, a 50-year-old refugee from the occupied Lefkonico township who resided at Avgorou village. 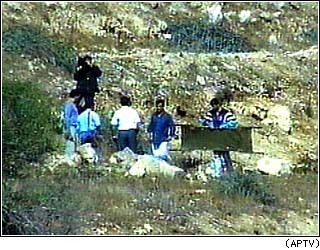 Kakoullis was shot in the area behind the old Akhna village Police Station, where Kakoullis had gone together with his son-in-law Panicos Hadjiathanassiou to gather snails. Hadjiathanassiou said that at some point he could not see where his father-in-law was. Eventually he spotted him at about 200 metres behind the old Police Station standing with his hands up. He also saw two Turkish soldiers on the ground aiming their guns at Kakoullis and then shooting him. When he fell on the ground, the two Turkish soldiers approached him and fired another shot at him. Efforts are being made through the United Nations Peace-Keeping Force for the body of Kakoullis to be given to the Cyprus police. Ïn behalf of the Cyprus Government, I would like to stress that the killing of Petros Kakoullis was a cold-blooded murder, which contains an element of pre-meditation, if one takes into account the fact that there was not any Turkish occupation army post in the location where the heinous crime was perpetrated. The Turkish soldiers left a nearby army post and went to the scene of the crime. According to an eye-witness, the victim Petros Kakoullis was quite harmless and was of no danger for the soldiers. When they shouted, he raised his hands with the intention of giving himself up. Despite this, the two Turkish soldiers shot him and when he fell down, they approached and fired at him again from close quarters while he was lying on the ground. As if this unacceptable behaviour from the point of view of justice and law was not enough, they did not allow anyone to approach the victim and we do not known when exactly he died, as he was left lying on the ground for almost four hours. The Chief of Police is on his way to Akhna to meet his opposite number at the British Bases. He has already spoken to him on the telephone and asked the intervention of the Bases in the conduct of investigations. Also the Police has summoned to Cyprus from England Professor P. Vanezis, an expert in medical jurisprudence, to carry out the post mortem. When the body of the victim is handed to the lawful authorities of the Republic, the post mortem prescribed by law will have to be carried out. Also Foreign Minister Alecos Michaelides is having contacts with the political heads of UNFICYP and the British Bases as well as the British High Commission so as to ensure at this stage the conduct of an impartial investigation into the murder. Firstly, we have to show how false the unacceptable and wholly unfounded Turkish allegations is that the soldiers first fired warning shots and subsequently, when the victim tried to escape, they shot him dead. This claim is unfounded and clashes with what the eye-witness said. Of course, both the findings of the investigation and the post mortem will show that this is a baseless allegation. We should not forget the circumstances in which National Guardsman Stelios Panayis was shot dead not long ago. There are many similarities between the murder in cold blood of Stelios Panayi and the present heinous crime. It is easy for anybody who is not familiar with the area to enter by mistake the Turkish controlled area. But this in no way justifies the response of the Turkish occupation forces to kill him. This is what makes the incident unacceptable and barbaric. As is natural, the continuing Turkish provocations make the Cyprus people feel abhorrence and indignation. However, I trust that we all realize that these provocations will have to be faced cool-headedly. It is evident that the goal of these provocations is to reconfirm the division partition of the island and the Turkish position that it is allegedly impossible for the two communities to co-exist and reunite Cyprus. This is the policy followed by Ankara and Denktash and we do not intend to facilitate this policy. On the contrary, we shall continue to seek a peaceful and viable solution to our problem and we shall decide how we shall react to this provocative action. In the coming days we shall calmly decide the measures we shall take. Asked if the murder of Kakoullis was what Turkish Foreign Minister official Inal Batu had in mind when he spoke of counter-measures to the joint exercises carried out by Greece and Cyprus in the context of the Nikiforos manoeuvres, the Government Spokesman said: "If indeed Turkey found an unarmed and harmless Greek Cypriot who was posing no danger to the occupation forces and killed him just to react to the strengthening of the island's defences, then it has committed an act of cowardice. However, I doubt very much if Turkey wants to project such a picture to the world". Replying to another question, Mr Cassoulides said that by acts such as the murder of Kakoullis in cold blood, the Turkish side "is trying to influence unfavourably efforts being made for the finding of a solution, in the sense that it is sending a message about its perceived need to maintain division and avoid peaceful coexistence. Therefore, it is obvious that this is the aim of such actions".